born 1960 in Munich, Germany. After studiyng classical percussion at the renowned Richard-Strauss-Conservatory he went on studiyng various ethnic percussion instruments in New York, where he performed with various groups including "M´Boom Percussion Ensemble", featuring Max Roach, brazilian "Grupo Batucada", featuring Jaco Pastorius. Besides various orchestral engagements at the Staatstheater am Gärtnerplatz, Bayerischer Rundfunk, Landestheater Innsbruck, Kammerspiele Munich he performed at international festivals like Aspekte ´83, Austria, Wiener Festwochen, Bregenzer Festspiele, Jazz Ost-West Festival, Berlin, or with the experimental Cine Sound Team at the International Film Festival in Dublin and the European Media Arts Festival. Mainly as a jazz percussionist he performed with the EBU International Big Band, the Jazz Composers Orchestra, Dave Samuels, Klaus Doldingers, Barbara Dennerlein, Charlie Mariano, Matt Garrison, Ack van Royen, Zoll meets the Masterfrank. In collaboration with choreographer Verena Weiss he composed the music to the 1996 dance theater production "Landschaft mit Göttinnen" at the state theater Innsbruck, Austria. His latest CD production "Expect Me" features New York jazz vocalist Alison Welles, renowned soloist Bob Mintzer and Grammy Award Winner Dave Samuels on vibes and marimba. born 1953 in Budapest, Hungary. Obtained his Masters of Music in classical percussion at the Musikhochschule Munich under professor Karl Peinkofer. Since then he had various engagements in different orchestras like the Bavarian State Orchestra, Bavarian Radio Symphonic Orchestra. In 1977 his love for the balinese gamelan music took over and he spent several extended periods in Bali and Java to study with local teachers. Since 1983 he is the head of the noneuropean collection of the musical instruments museum at the Munich Stadtmuseum, where he, among other things, initiated the exhibition of a complete set of javanese gamelan instruments and teaches very successfully gamelan music to students. 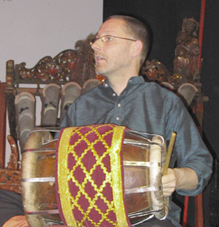 Besides that he has teaching assignments about balinese music at the Ludwig-Maximilian-University, Munich, at Southeast Asian Studies University Passau ( SEAP ) and others and did his doctorate at the Eberhard-Karls-University, Tuebingen by publishing his PhD thesis "Gong Ageng" on the art of javanese and balinese gong manufacturing. Since 2006 he is professor for "Music of other Cultures" at the Musikhochschule in der Westfälischen Wilhelms-Universität in Münster. 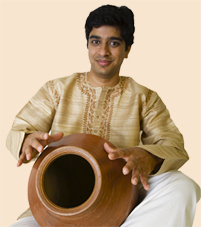 A versatile ghatam artist from Bangalore, South India, who studied under Vidwan K.N.Krishanmurthy of Banglore. Started performing at a very early age of eight. He also performed in All India Radio at the age of two and a half years. He has achieved many prestigious awards including the 1995 Best Sahavadayam award, given by Bangalore Gayan Samaj. He has also won many competitions including the 1997 National Competition conducted by All India Radio. He was also awarded scholar ship by Centre for Cultural Resource and Training (CCRT) and he was the only student who was awarded this scholarship through out India for the instrument Ghatam. He has regularly performed on Radio and Television and accompanied many leading artists like Sudha Ragunathan, Lalgudi Krishnan, Kadri Gopalnath etc. 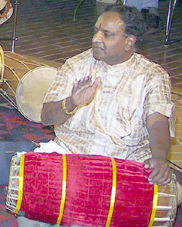 Currently he is working as a Senior Mridangam Teacher at London Tamil Centre, Wembley London. he was born in Isfahan, Iran in 1978. His parents, both musicians, enabled him to take his first tombak lessons at the early age of six. He quickly felt the power of music deep inside. At the tender age of 9 he began developing his own unique way of playing the drum. From that point on the tombak became the main driving force in his live. At ten he entered a music competition in Teheran and won first prize, and went on to retain the trophy for the next six years. During this time he upgraded and revolutionized tombak playing by streching its traditional borders. 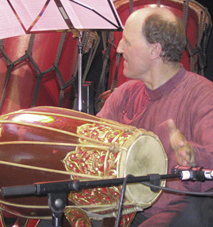 His finger techniques and sound variations gave the tombak a new voice. Over the next decade he gave countless concerts and led a percussion ensemble. At age 22 he travelled to Germany for the first time. He released several CD«s and decided to continue his art and live in Germany. In 2003 he received the world music young talent award at the international Root festival in Rudolstadt. 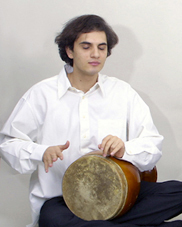 In his many years of intensive experience of playing tombak he developed many new techniques and effects as well as establishing a completely new style. 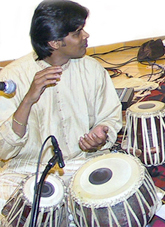 a very well known Tabla Player of the Benares Gharana, hails from a family of musicians and fine artists in Allahabad. His father, Sri Partho Sarathy Mazumdar(Dulal Da), is among the first-generation guitar players in the field of indian classical music. His first encounter with the Tabla was under the tutelage of Dilip Kumar and Alok Ganguly. In 1981, he turned to the eminent Kaviraj Pandit Asoutosh Bhattachary, in 1989 Udai shifted to Delhi and became the disciple of the world-renowned Sitar Maestro, Pandit Ravi Shankar. He is a regular performer on the Indian national radio and television channels and played on wellknown indian festivals such as the Durgalal Festival, the Saptak Festival, Vasanthabba Festival, etc. His international sojourns include the International Folk Festival, Hungary, World Music Festival,Rome, International Drum Festival, Germany, Kent State University, USA, Ragamala, Canada etc. Udai also has credits on the CD´s "Echoes from India", "Fulfillment", "Sabotinski Stenimals", and "Reverberations" and "ShankaRagmala". Based in Delhi and Basel, he is seriouly engaged in performances and teaching , and continues to learn from both Kaviraj Pandit Ashutosh Bhattacharya and Pandit Ravi Shankar. born 1950 in Jaffna, Sri Lanka. He hails from a very famous south indian musical dynasty. Being influenced by his brother, the famous tavil player V. Thedchanamoorthy and his nephew, mridangam virtuoso Palni. M. Subramaniampillai he started to study the mridangam at the early age of four under his father, nadaswaram virtuoso Palni A. Angappahpillai. Later he continued his studies under A.S. Ramanatham. From the age of twelve on he begann his professional career, playing tours with classical south indian music groups in Sri Lanka, India, Malaysia, Singapur and Europe. Among the musicians he played with are famous indian drummer Sivamani, T.V.Gopalakrishnan, Prof. Maythily or Dr. Shivachithambaram, the son of the wellknown singer Dr. Cheerkaly Govindarajan. At the moment he resides in germany, teaches carnatic music all over europe and plays international concerts with classical south indian group.